There is an age-old proposition, common among mystics and ancient philosophers, that reality – the world of objects and of everyday appearances – is nothing more than an illusion. Buddhists and Hindus speak of this as the veil of Maya – an artificial screen of perceptual phenomena that masks a deeper and wider cosmic consciousness – and there is much in Islamic thinking that posits a similar understanding of ‘reality’. In the Twentieth Century, the discovery by modern physicists that all matter exists only as a shifting field of energized sub-atomic particles, strongly reinforced these ancient ideas of reality being nothing more than an artificial projection of the mind and gave them a new impetus. In the world of art such realizations led increasingly to the development of abstraction and to the propagation of an abstract language of form. In complete contrast to this, Donald Judd’s work, with its pure concentration of material and geometric form, appears to exist at the opposite end of the spectrum to these concepts of reality-as-illusion. 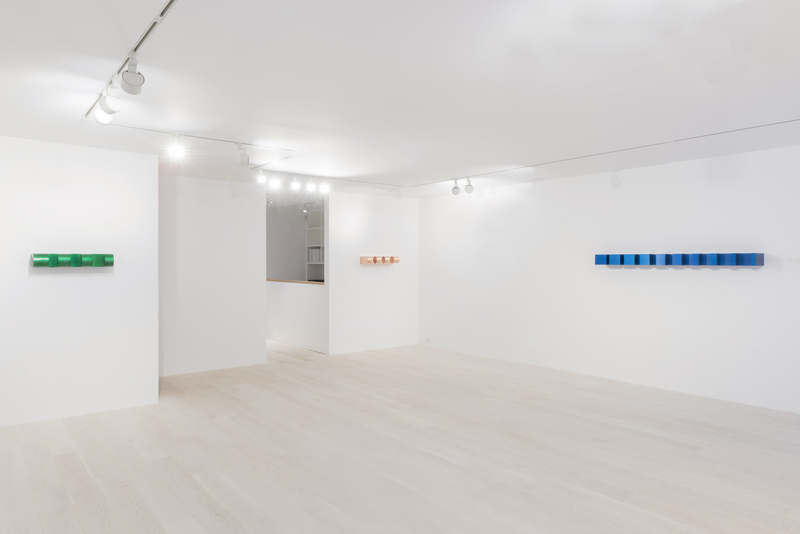 Like surveyor’s marking posts mapping out the perceptual landscape of objective reality, Judd’s art investigates the material nature of the world we live in using only the simplest geometric forms and materials as its tools. 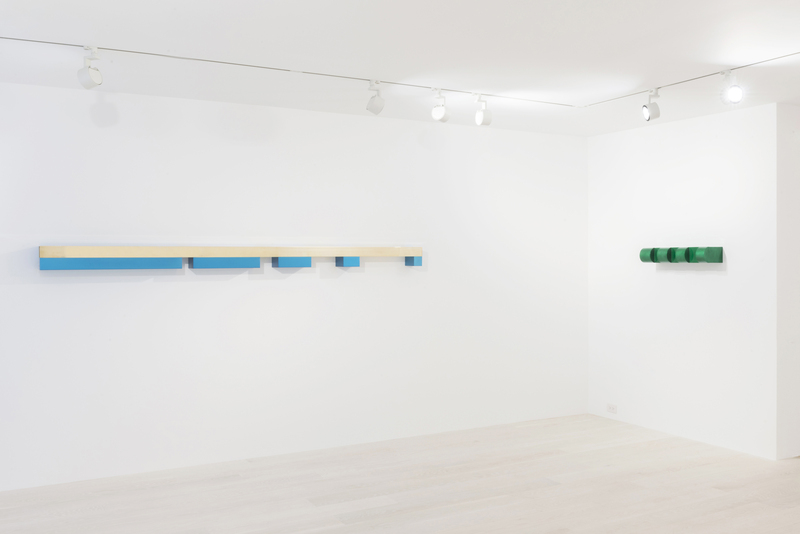 Employing only space, material and color in a single or repeated progression of form and by manufacturing each work with industrial precision, according to strict mathematical guidelines – Judd’s art creates a paradox. It is, in fact, so simple, so pure, so ideal and so perfect that, in spite of itself, it often seems to belong to another world. Expressing both the precision and the abstraction of mathematical logic in material form, Judd’s sculptures appear to calibrate the limits of our material reality like some extra-terrestrial slide-rule or theodolite. The essence of Judd’s provocative aesthetic is represented by his two principle and best-known series of works: the Progressions and the Stacks. These works, first made in 1964 and 1965 respectively, form the twin pillars of his oeuvre and run through it like a constant from the time of their first creation right up until the artist’s death in 1994. Comprising two material measurements of real space – one vertical (the Stacks), the other horizontal (the Progressions) – each takes the form of a linear, mathematical progression of alternating solid form and empty space. In these works the gaps of space and the blocks of form are derived from simple additive progressions such as 1,2,3,4… or the Fibonacci sequence, (1,1,2,3,5, 8…)., for example. As a result, these works measure out an intervention into the space around them with such clarity and precision that they surprise the viewer into a more acute appreciation of the spatial environment that they themselves inhabit. The Progressions exist in two basic formats: that of a bar under which a ‘progression’ of rectangular blocks and empty space is articulated, and the more classical format of a, usually colored, metal bar of undulating and projecting form (either square or bull-nosed) jutting out into the space of the room. Looking like space-age apparitions materializing on a blank gallery wall, such works map out the logic and dimensions of our reality with such precision, geometry and unusual accuracy that, ultimately, they seem to hover on the borderlines between concept and actuality. In so doing, these apparently cold and rational materializations of alternating form and space take on a strange aura of apparent mystery and magic. Judd’s contemporary, Robert Smithson, famously called this quality of Judd’s work, an ‘uncanny materiality’ – something that Judd himself firmly rejected. Wary of the unaccountability of all mysticism, Judd argued that any sense of the ‘uncanny’ in his work came from his works’ articulation of what he called the usually ‘invisible’ elements of art; ‘space and color’. By making these basic elements an equal and essential part of his work, as in the sensual use of colored metals in his Progressions or the see-through colored Plexiglas of his Stacks, Judd believed that he was making visible an entire area of art-making that had previously been hidden. 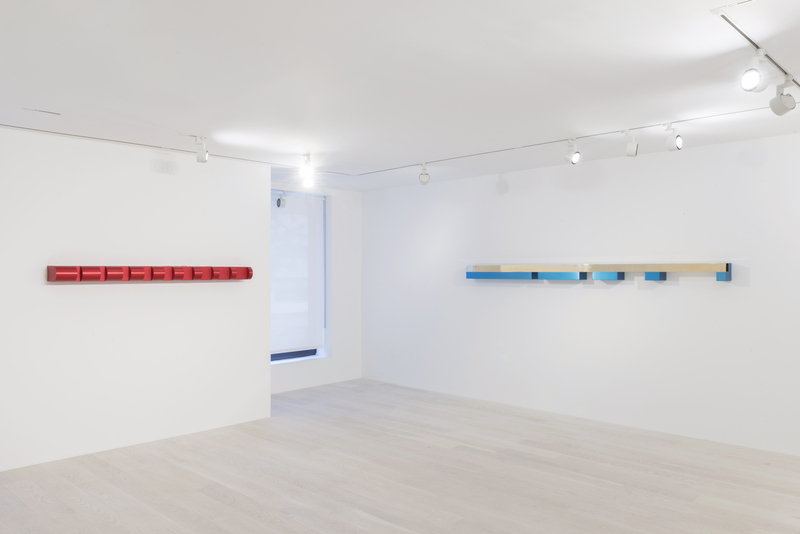 Judd was, in fact, bringing the subtlety of his painter’s eye to bear on the establishment of an innate sense of harmony and balance emanating from within the strict logic of his three-dimensional, wall-mounted works. Critical of all collective terms when applied to art, Judd roundly rejected any notion of ‘mysticism’ in his work in the same way that he rejected the term ‘Minimalism’ – the movement with which he is most often associated. In taking the cold, undistilled, material logic of his art to its mechanical and mathematical extreme however, Judd created a unique and enduringly powerful body of work that seems to exist in an impossible but nonetheless fascinating place. Halfway between reality and vision, between the tangible and the transcendent, Judd’s sculptures continue to captivate because they seem to articulate a meeting point between two incompatible extremes.